A peril of hobby-centric media consumption is the lure of making “zeitgeist” and “the conversation” feel essential to enjoyment. Experiencing a thing when it’s not at its height of being talked-about feels wasteful. You feel like you could and should be experiencing that thing that everyone else is raving over. If I don’t participate right now, how else will I be able to deliver my assuredly relevant take on the matter? Most directly, for me, this applies to gaming since outlets dedicated to the subject form the bulk of my consumption habits. They almost exclusively cover what’s current and what’s to come, rarely looking back. Last night I played XCOM: Enemy Unknown, which was released in *gasp* 2012. I played it because *embarrassed groan* I like the game. This feeling of shame is entirely self-manufactured but palpable nonetheless. With an addiction to social media it’s hard to not get wrapped up in the non-stop, sharing of opinions on those channels. So, what then do I do when I fall in love with a game whose moment has truly passed? Upon visiting my Friendly Local Game Store I impulsively bought Android: Netrunner, a card game that had languished on my wish list for years after being gushed about endlessly by various gaming taste-makers whose opinions I admire. I had until then resisted buying Netrunner because I knew I’d struggle getting it to my table. My wife and friends aren’t into that style of game, plus our game nights by default don’t tend to feature two-player games. A friend teasingly bought the game and that was enough to push me over the edge. Netrunner is a two-player, asymmetric game where the opposing sides have very different cards, rules, and victory conditions. It’s a Living Card Game (LCG), a genre name that seems to have been widely adopted despite being trademarked by Fantasy Flight Games, current publisher of Android: Netrunner. A LCG is a game where you can build your own deck from a set pool of cards. The “living” part of “LCG” comes from the concept that new packs of cards are released regularly, typically reshaping the strategy of your deck-building each time that pool of cards gets deeper. Every pack of Netrunner cards you purchase has a specific, published list of cards within and while there (of course) are many packs available for purchase, the field of play is a bit more fair than the typical collectible card game. The main example being the mega-hit Magic: The Gathering, where you also build your own deck, but the contents of its card packs are completely randomized. Success in that kind of game largely depends on the health of your checking account. I finally got to play Netrunner and sure enough, I loved it. It has everything I enjoy about games like Magic: The Gathering, including its fast-paced tactics, interesting card combinations, and playing with the fixed randomness of a deck of cards. And again, my sense of competitiveness doesn’t feel as threatened because my opponent was able to outright buy a better deck than me. Netrunner is set in a cyberpunk world where one player is a corporation amassing wealth and protecting its assets with security programs. The other player takes on the role of a hacker, or runner, assaulting the corporation’s network, trying to steal its data. The game is fairly quick to play and primarily about revealing hidden information and playing your cards at the right time. I soon realized that it was something I’d unhealthily obsess over. There was an immediate problem. Netrunner, at least in this iteration, has officially been declared dead. In June of 2018, Fantasy Flight Games announced that it would not be renewing their license of the Netrunner property (or more likely the owners of the property, Wizards of the Coast, made renewal too expensive, seeing the potential of profits for themselves). After October, 2018 there will not be any more new card releases for the game. For a LCG, with “living” directly in the genre name, that’s certain death. 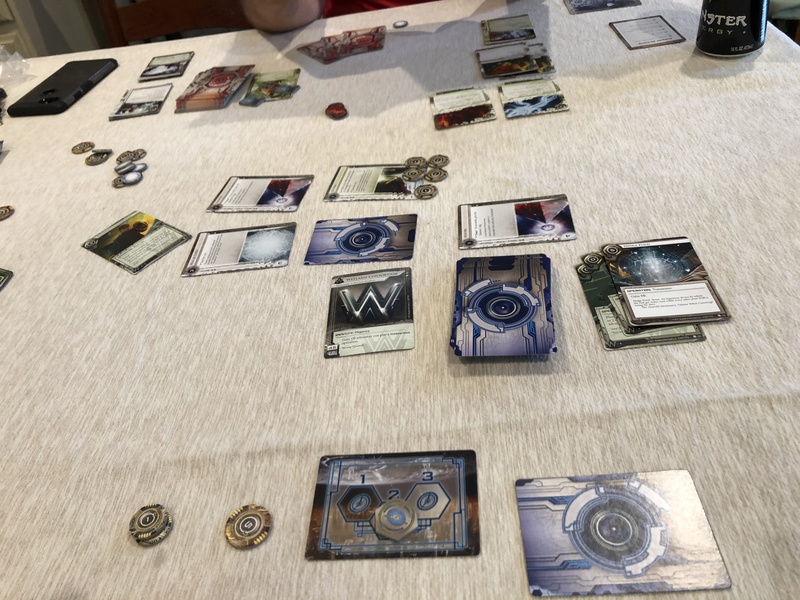 Netrunner has been incredibly popular with regular tournaments held around the world, a host of podcasts dedicated to spirited discussion of the game’s strategies as new card packs were released, and much more. Now, in the height of my own enthusiasm, I explore Reddit posts looking for suggested ways of building decks, I fervently listen to ancient podcast episodes (Terminal7 and Run Last Click being my favorites), and even have started playing online in a bid to better understand this dense but rich game. All while the community slips away to other games. I went down to that same Friendly Local Game Store for their “LCG Night”, my Netrunner box in tow, hoping to find someone not afraid to coddle a player new to the game. There wasn’t a Netrunner game in sight. I gently interrupted two people huddled over a match of A Games of Thrones: The Card Game, another Fantasy Flight offering, and asked if anyone around there was still interested in playing Netrunner. No doubt the scene will go on in some form, arguments over the game’s meta about the best/most broken cards forever spinning their wheels with nowhere to go. I only have the core Netrunner set and I keep waffling over buying other card packs for myself. Is it even worth the money? After the big announcement, eBay prices on Netrunner card packs are rising accordingly (and they weren’t cheap to begin with). Will prices eventually come down as people lose interest in the game, or will rarity keep them eternally out of a range I can reasonable justify? Even so, what’s the point of buying more physical cards when I’ll have very few people, if any, to play against? I’m likely better off playing Netrunner online where even though it’s morally wrong, I have access to every card and don’t have to pay exorbitant costs. I missed it all. It seems in this rare case, I should have paid better attention to the zeitgeist. Let me know if you’d like to play Netrunner some time, for while I’m still learning the game, at least we don’t have to worry about keeping up with any changes. I see your fret, but I say, only fret a bit! FFG Netrunner may be closing up shop, but the game is actually going “underground.” An organization called NISEI will be carrying the banner into 2019. This is essentially a group of community members who are going to keep the game alive–first by running some organized play, later, by making tweaks to the active card pool (taking something off the restricted list, putting some things on…essentially keeping an eye on the meta), and perhaps even later down the road they will be creating new content. So you may love a dead card game, but you are entering a community (online and IRL) that is very passionate about seeing the game continue! That’s really great! I’ll keep an eye out for what you all are up to. Thanks for visiting!